make its account funding process easier, fast and secure. FXGiants is another major regulated Forex and CFD brokerage, which ended up with a nasty reputation after a 2015 series of debacles. To this day, there are many user complaints online about the operation, most focused on how FXGiants make it difficult for their clients to withdraw funds, while making it extremely easy for them to deposit. With that in mind, why should you choose FXGiants as your Forex broker? The brokerage offers superb trading platforms and access to over 200 tradable assets. The international scope of the operation is obvious: it covers some 150 countries, from Europe to Asia and even Latin America. Perhaps most importantly though, FXGiants’ regulatory status is quite spotless. The main regulator behind the operation is the UK’s FCA. Indeed, in a way, it can be said that FXGiants is based in the UK. Represented by 8Safe UK Ltd, FXGiants are linked to IronFX in some ways: 8Safe UK Ltd. is indeed the UK anchor of IronFX too. To make a long story short: the FCA license number of the operation is 585561. 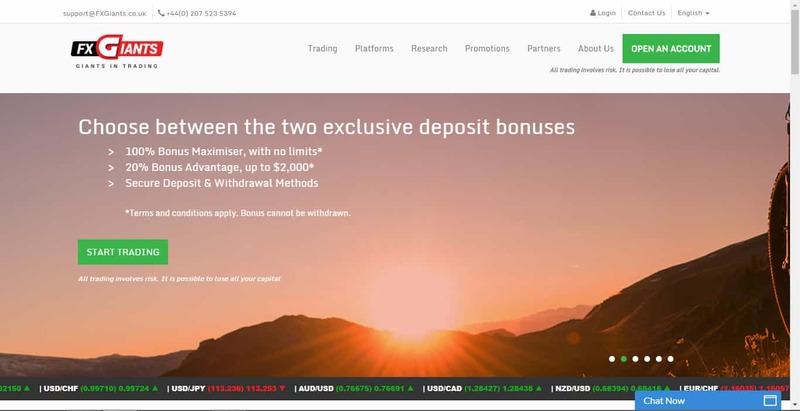 Some reviewers say that the brokerage possesses an ASIC license as well, through an Australian subsidiary, but the official website of the operator does not provide any information in this regard. The security of the trader funds is another operational area where FXGiants excel. The funds deposited by clients are kept in accounts with top-tier banks. A full segregation of clients funds is observed at all times, meaning that client monies are never mixed with the funds of the brokerage, used for everyday operation. Perhaps most important in this regard is the fact though that FXGiants is a member of FSCS and as such, it can offer unparalleled protection to its customers funds-wise. The Financial Services Compensation Scheme covers traders up to an unprecedented £1 million, through its Excess of FSCS Insurance. Yes, even those whose assets exceed the £50,000 mark, are now entitled to compensation if something goes wrong with the broker. In addition to all the above, FXGiants feature various risk-management systems meant to prevent traders’ accounts from going negative. All the legal documentation concerning the activity of the brokerage is available at the FXGiants website. Another strength of the brokerage resides in the deep liquidity pool it offers. Its liquidity providers are all high-profile international financial institutions, like Bank of America, Citi, Deutsche Bank, JP Morgan, Goldman Sachs, and others. While most regulated Forex/CFD brokers are rather stingy when it comes to handing their clients extra value through various promotions, FXGiants certainly buck this trend. For starters, they throw in a free VPS service. Considering that their trading platforms are essentially MT4 and its various versions, that is quite a considerable advantage for traders. A proper VPS service allows clients to run their EAs (Expert advisors) 24/7, without interruptions and downtime, and without having to run their own computers. The VPS service offered by FXGiants is focused exactly on the EAs. In order to be granted a VPS, traders have to make a minimum deposit of USD 5,000 or equivalent, and they have to maintain that balance for months. Those who do not meet this criteria, can request a VPS too, though they will have to cover a monthly fee. VPS access increases the execution-speed of one’s trades, eliminating the possibility of slippage. It gives EAs 24/7 uptime and it can be accessed from any device, 24/5, from all over the world. In addition to this rather technical promotional deal, FXGiants have more fun-oriented promotions lined up as well. Live account holders can take part in trading competitions, through which they can take down $5,000 cash prizes or tickets to the Northern Lights Cruise. The Cruise promotional package includes a 6-day trip, an all-inclusive cruise, accommodation, airfare as well as various transportation-expenses, for two. The FXGiants website features a live trading competition ranking, which is updated every hour. For the rank-and-file trader, the two bonus deals offered by the brokerage are much more appealing though. The 100% Bonus Maximizer offers a 100% match on all client deposits, without an upper limit. The minimum required deposit for this bonus deal is $500. The received bonus cannot be cashed out, but those who receive it, will certainly have more “ammo” to trade with. The profits accrued with the help of the bonus are fair game. The 100% Bonus Maximizer deal can be rescinded if the user makes a withdrawal request during the promotional period. The other bonus deal is the 20% Bonus Advantage, the upper limit on which is $2,000. The minimum required deposit on this deal is $100. This bonus cannot be withdrawn either. As said above, FXGiants’ platform-offer is focused on MT4. Several versions of the popular trading platform are available, including the MT4 PC, PC Advanced, Mac and Android/iOS versions. Advanced charting features with flexible time frames are available on all platform versions. The Advanced PC version is obviously the one with the most perks and extra features. Real time quotes, trading signals and activity reports are available on all these platforms. EAs can be thrown into the mix as well. Chart templates can be personalized and saved for later use. More than 50 technical indicators are included in the base package. Traders are obviously welcome to install more such indicators. Every MT4 version can be downloaded directly from the FXGiants website. Demo accounts are available for every one of the platforms and there’s a handy user guide as well. The PMAM (Personal Multi Account Manager) is a nice touch too. It is aimed at money managers, allowing them to set up multiple funds and to administer an unlimited number of accounts. The account-type selection includes no fewer than 7 different options. The Micro account is the cheapest and most accessible one. It gives traders the option to choose between Live Fixed and Live Floating spreads. The minimum required deposit in this account is just $100, which makes it extremely attractive indeed. Through this account, with the floating spread option, spreads can be as low as 1.1 pips on the EUR/USD pair. The Premium Account is similar to the Micro one, with the difference that it costs a lot more (its minimum deposit requirement is $2,500) and it offers much better spreads. With the floating spread option, the spread can be as low as 0.7 pips on the EUR/USD pair. The Zero Fixed Spread account requires a deposit of at least $500. It features no spreads, but it does charge commissions, which start from $18/lot. The other available account types are the STP/ECN No Commission account, the Absolute Zero STP/ECN, the STP/ECN Zero spread and the Absolute Zero Plus STP/ECN account. FXGiants’ direct support email is support@FXGiants.co.uk. info@FXGiants.co.uk can be used as well. The customer support phone number is +44(0) 207 523 5395. Toll-free phone numbers are available for a plethora of countries, including China, Poland, Hungary, Italy, Russia and others. FXGiants offer decent trading conditions, an attractive selection of products and outstanding platforms. Their reputation may not be the best, but their current offer is certainly attractive enough.